This week’s list is inspired by a barrage of recent scientific studies offering good news about middle age. Middle age has long been conceptualized as that phase of life where we cease thinking about our potential as human beings, and start focusing on our limitations. No more. While not everything looks rosy (stay tuned for next week’s tip list), there are at least a few trends out there that do bode well for those of us hovering at the mid-point of our lives. 1. People are living longer. According to scientists, more people than ever before are living to older adulthood. In the U.S., the average lifespan has risen 30 years since 1900. And today’s older adults are better-educated, healthier, more active and more affluent than any previous generation. Plus, as I pointed out last week, the labor market is becoming more diverse and there will be more jobs for the over-55 set. So there’s lots more time – and more to do. 2. Our brains keep evolving. New research also shows that – contrary to the long-held view that our brains get fixed in early childhood – circuits in the adult brain are, in fact, continually modified by experience. The result? In some respects, we actually think better in middle age. Specifically, inductive reasoning and problem solving improves in the middle-aged brain. We get the gist of an argument better. We arrive at solutions more quickly. Even financial judgments peak in middle age. 3. People are happier over 50. This is also both surprising and welcome news. A survey of more than 340,000 people published in Proceedings of the National Academy of Sciences found that overall feelings of wellbeing improve as we pass middle age. Specifically, levels of stress, worry and anger all dropped significantly for people in their fifties, while levels of happiness and enjoyment increased. While the study wasn’t designed to identify the causes of increased happiness, scholars speculated that with age comes greater wisdom and emotional intelligence. A similar study carried out in Canada also found that self-esteem is highest among middle-aged boomers. The corollary of all this research? We can probably expect to see fewer mid-life crises. 4. Even divorce can be positive. As the endless analyses of Al and Tipper Gore’s break up tell us, late divorce (i.e. divorce in marriages 20 years or longer) is increasingly common. But it’s also not necessarily a bad thing. A large number of articles that followed on the Gores’ split emphasized late divorce as a form of autonomy and self-actualization – especially for women – rather than just sticking it out for longevity’s sake. For me, at least, that was the first time I’d seen divorce as a cultural trend discussed in positive terms. 5. The AARP has had a makeover. Yup, that’s right folks. The American Association for Retired Persons (that’s AARP for all those in the know) has had an on-line overhaul in order to cater to the digital demands of the over-50 crowd. So for all you aging Facebook-ers out there, you have a new on-line hang out. 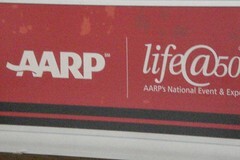 Image: AARP by Somewhat Frank via Flickr under a Creative Commons license.